Beneath the radar, Farmington grew into a credible art town that’s spurring downtown’s revival. Above: Pottery from Artifacts Gallery in Farmington. Photographs by Julia Vandenoever. “I do, too,” Taylor says. And, boy, does she. Her husband, Tom Taylor, inherited the onetime Farmington Lumber and Hardware Company, on the eastern edge of the old downtown. After the big-box stores nicked their customer base and the retail action fled from the town center, the couple decided to give Bev’s long-held dream a try. 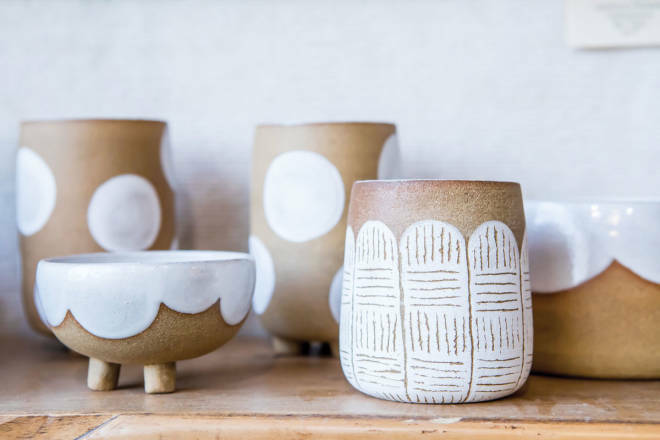 A painter, illustrator, and calligrapher who also does elaborate wood carvings with her husband, she wanted to offer studio space and collect like-minded creatives under one roof. She never dreamed it would grow into a maker space, a business incubator, an events hall, a pastry shop, a salsa-books-and-aprons gift shop, and a key force in reinvigorating a town reeling from job losses in the oil-and-gas industry. She met that goal and then some. In addition to resident artists, Artifacts represents dozens more from throughout the Four Corners and invites all comers to enter work in regular shows. (It’s Springtime Somewhere opens May 11 with a 5–8 p.m. reception.) Free drop-in painting sessions, every Thursday at 10 a.m., alternate still-life and live-model subjects. Taylor regularly offers art classes and will even design a specific one with a few days’ notice. Her daughter, Tara Churchill, opened the Bake Shoppe late last year, crafting artistic cookies and cupcakes. It hasn’t been easy. Traffic whips past the place and barrels along Main Street through a downtown that’s an equal mix of empty storefronts and inventive entrepreneurs such as the popular Three Rivers Brewery. With an oilfield slump, town leaders are striving to draw more visitors to Farmington and know that they have a few reliable jewels in their pocket: stellar fly-fishing in the three rivers that converge here (San Juan, Animas, and La Plata), the nearby boating haven of Navajo Lake, the eerie landforms of the Bisti/De-Na-Zin Wilderness, some of the best mountain biking and off-roading in the nation, an avid disc golf community, and an artistic core that starts with tribal traditions. “Anytime we talk about downtown revitalization,” Taylor says, “the art scene keeps coming up.” For generations, that scene here in the far northwest corner of the state has largely been about the work of the nearby Navajo, Hopi, and Ute peoples. Founded as a railroad town in 1901, Farmington was known for its rough-and-ready workers. But in recent years, a quiet sort of art colony developed among non-Native people—enough to impress Taylor in the mid-1990s, when she put out the call for a handful of studio spaces. 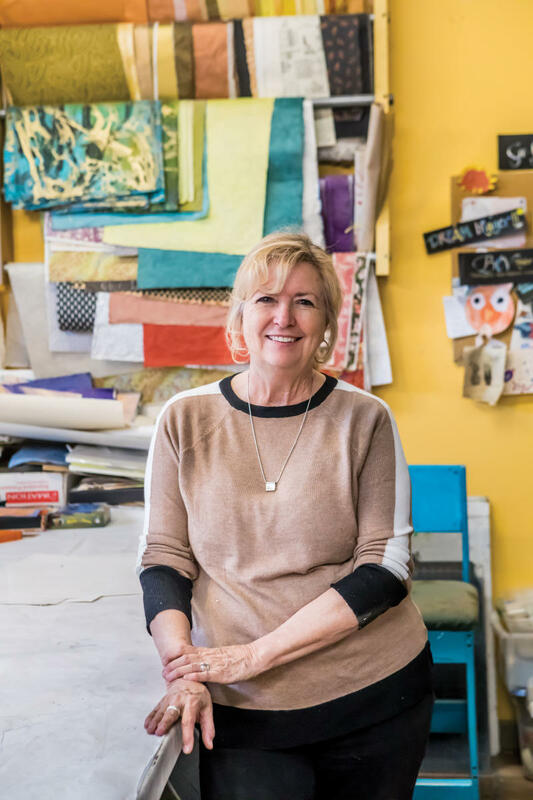 “People kept coming in and asking, ‘Have you got studio space?’ I didn’t know we had so many artists here.” She wondered how to wed the region’s various styles of art into one economic generator, and her big idea grew even bigger. The couple shouldered the renovations necessary to claim 17 artist spaces, plus a gallery, as well as a teaching space in the main hall, where trucks piled with lumber used to rumble through. “I think the arts here are something people even in Farmington don’t know—and it’s a big part of downtown revitalization,” says Michael Bulloch, downtown coordinator for the city’s MainStreet program and a watercolorist with a first-floor Artifacts space. Seated among his paintings, which depict landscapes in deeply saturated jewel tones, Bulloch ticks off downtown success stories, including Artifacts and Three Rivers, as well as the Dusty Attic antique mall, a new comic-book store, and a variety of galleries, from Native to contemporary. Above: Beverly Taylor owns Artifacts Gallery with her husband, Tom Taylor. Karen Ellsbury already embraced that burst. She had an Artifacts studio, but when her husband died, in 2007, she and Taylor just sat and cried each time she arrived to work. She decided to leave, and Taylor told her that the grief process would change her swirling abstract paintings. Ellsbury didn’t believe her. Then her paintings began revealing the chaos that Ellsbury felt out in the world—the points of view became more realistic, but drips and dollops both obscured and defined the shapes. By 2011 she’d married photographer Patrick Hazen, and the two soon opened Studio 116, a few blocks west of Artifacts. Her works expanded into wildly creative furniture (imagine an end table made from a reengineered trombone) and mashups of his Bisti photos with her abstract additions. “Bev was just wonderful to me, she really was an incubator,” Ellsbury says. She and Hazen are turning the rear of the studio into a courtyard for performances and art markets, and the coming year will make that amenity even more critical. A long-planned effort to spruce up Main Street, add more parking, and slow motorists with traffic circles could block merchants’ front doors during the months of construction. Book a few nights at the Casa Blanca Inn, the boyhood home of Tom Taylor, since expanded by other owners into well-furnished rooms around a landscaped courtyard, with convivial breakfasts (505 E. La Plata St., 505-327-6503, casablancanm.com). Start your art walk at Artifacts Gallery (302 E. Main St., 505-327-2907, artifacts-gallery.com), then head west, keeping an eye out for the Three Rivers Art Center and Gallery (123 W. Main St., 505-716-7660, on Facebook), Studio 116 (116 W. Main St., 505-258-4514, on Facebook), Alex Benally’s Hogan (308 W. Main St., 505-564-3404), and Wal Art Gallery and Framing (422 W. Main St., 505-327-3336, on Facebook). Time your visit for the Thursday evening Downtown Makers’ Market (101 N. Orchard Ave., 505-599-8442, farmingtonnm.org/events). Or check the events calendar at San Juan College for music, theater, and movies (sanjuancollege.edu). Fuel up with the robust menu at Three Rivers Brewery and chase it with their craft beer or local spirits (101 E. Main St., 505-327-6503, threeriversbrewery.com). For more on Farmington’s art, cultural, and recreational options, visit farmingtonnm.org.